Oxford United chairman Ian Lenagan says he will only judge manager Chris Wilder when his players are fully fit. The U's are 17th after six successive League Two defeats and some fans have called for Wilder to be sacked. 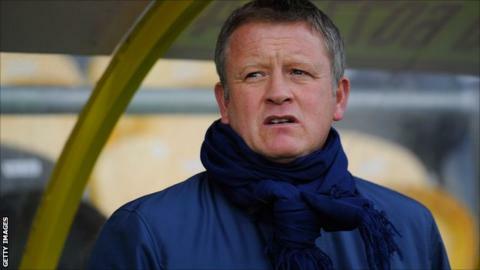 "Chris Wilder will stay with Oxford United, but there is a tipping point," Lenagan told BBC Radio Oxford. "I am strongly of the opinion that you judge a manager when he has had the opportunity to have his strongest squad on the field and not before." The U's have had a host of injury problems since pre-season with Michael Duberry, Liam Davis and Andy Whing all missing while Adam Chapman and Jon-Paul Pittman are also out at the moment with Peter Leven still not fit enough to start. Whing though has now returned to training and Lenagan, who has invested around £650,000 in the club since taking over as chairman in the summer, admits the results have been hard to take. But he says he will not be forced into making a rash decision over Wilder's future, recognising how hard his side have been hit with injuries this term. "We all hurt at the continuing losses so I can well understand the anger and rage of Oxford fans," he said. "My job as chairman is to stay calm during that storm and make considered and balanced judgements on behalf of Oxford United. My experience tells me that in many cases reactive judgements that the fans want us to make can often lead to more destructive results. "I am not afraid to make the decisions that fans are calling for but I am afraid of making the wrong decision and I am determined not to do that no matter what the external pressure is. "The reality of the current performance is that the squad is seriously affected by pre-season injuries and new injuries so it's impossible to say yet whether this squad and the current manager are capable of our target of promotion." The U's owner, who is also chairman of rugby league side Wigan Warriors, added: "Even after six straight losses we are only nine points off the automatic promotion places. Our injured players are returning at a reasonable rate and most are scheduled to return before November and it won't be long before we can make that judgement. "But to make that judgement now would be wrong and unfair and I won't do it even if there are loud and insistent fans saying we should do it now." Meanwhile, Lenagan says a dispute with former director Jim Rosenthal has been resolved with the television presenter being paid back a £100,000 loan he gave the club several years ago.